SEM traffic is a bit like scotch whisky. You might think you’re getting a pure single malt from the glens of Google or Yahoo, when in fact you’re washing down a blend of different traffic sources. Sure, you’ll get the strong flavours of the world’s leading search engines, but often there’s an after taste of something else. And that’s not always pleasant. Last week, New Media Age’s Will Cooper picked up on some unwanted after taste from Yahoo’s search partner network, prompted by Efficient Frontier’s latest quarterly search engine report. 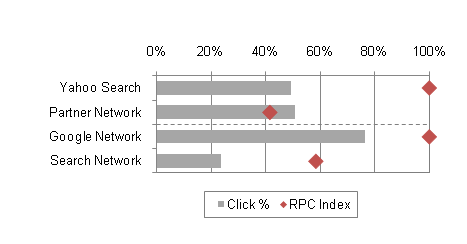 The grey bar represents the percentage of clicks of the whole campaign that come from either the search engine itself or one of its partner sites. 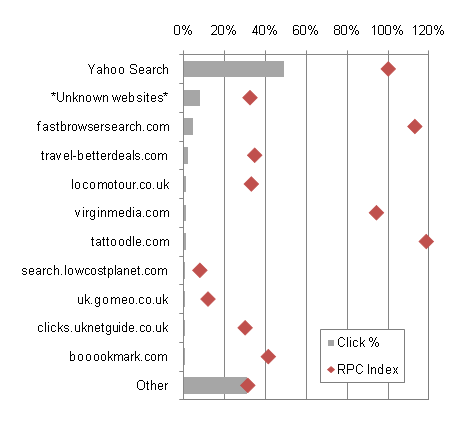 The diamond shows the relative quality (revenue per click in this case), where the search engine itself is always indexed at 100%. Note that above Google and Yahoo are indexed independently; I’m not saying they have equal traffic quality. The first thing to note is that both Yahoo and Google’s partner networks deliver significantly worse quality traffic compared to the engines themselves. The second is that Yahoo is much more dependent on its partner network for total traffic than Google is. Let’s look how Yahoo breaks down in detail: You’ll notice is that there’s not a lot of well known names. Those that are there don’t tend to convert as well as Yahoo does. Aside from the unknown sites (which couldn’t be identified for various reasons), the largest partner is fastbrowsersearch.com, which is a toolbar. Surprisingly though, it converts better than Yahoo itself. 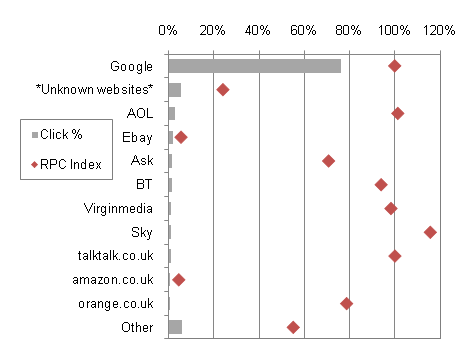 Contrast this with the data taken from the Google campaign: There’s lot of well known ISPs and portals there. Many of them convert as well, or even better, than Google does. But there are two sites, Ebay and Amazon, which convert very poorly compared to Google. This may be due to the particular data sample. However many SEM professionals argue (myself included) that they aren’t search sites in the original sense and shouldn’t be in the Search Network. I often say that there’s no such thing as good traffic or bad traffic. It is either correctly priced or incorrectly priced. That’s improvement number one: let SEMs break out, filter and bid on these different traffic sources separately, just as we can between Google Search and Content. Yahoo introduced domain exclusion some time ago, though it’s somewhat unweidly in the current form. But that’s still better than Google, which gives you no such flexibility (even though you can do it easily on the Content Network). Finally, Yahoo needs to adopt Microsoft’s Adcenter platform as soon as possible. The reason Google has such high quality sites such as AOL, BT and Sky is that it monetises the traffic much better than Yahoo does. From all the data I’ve seen, Adcenter can do an equal job to Google. It will give Yahoo much better commercial clout when negotiating distribution deals. Once Yahoo! adopts Bing's platform I don't think it will give them much clout for negotiation. How will they be able to pay a higher revenue share for distribution than Microsoft can? The reason that Yahoo! 's core search revenues were so brutalized was the terrible set of features which forced you to buy fraudulent traffic if you wanted Yahoo! Search traffic. If Yahoo! would have been less lenient with partners (and/or made better traffic filtering options) there is a good chance they would have made far more from search and been less willing to sell it off. IMHO anyhow. Yes Yahoo! allows domain filtering…but sometimes feed from domain x appears on domain y and even if you filter domain x you still get stuck buying that traffic. Worse yet, as it goes through the domain x redirect you can't even sell all the domains y and z that are carrying the sub-syndication to block them. Love the above graphs BTW 🙂 They really highlight how and why Yahoo! has sunk so bad. Interesting. did not realize that my search results was a combination of several smaller search engines. What do big brands use for SEM bid management? Is it time for Ad Tech 2.0?